The pecans that grow in Missouri may seem small, but they offer some of the tastiest eating around. Thanks to the state’s short growing season, the meats from the nut tend to be sweeter with more oil content than the larger versions grown in other states further south. This makes the pecans highly desirable both commercially and in-home gardens across the state. As the only major nut trees native to the United States, the word “pecan” comes from a Native American word meaning “all nuts requiring a stone to crack.” Wild pecan trees thrive in central and eastern North America, as well as the river valleys of Mexico where waterways provide easier access to these tasty food sources. The first known cultivated trees were planted by Spanish colonists in northern Mexico in the late 1600s. In the United States, the first pecan trees were planted in 1772 in Long Island, New York. Pecans were popular with Native Americans who found the shells easier to crack than other nuts. The nuts also provided a valuable food source during late autumn when the nuts were gathered and saved for use in the winter months. A fermented drink called “powcohicora” was also made from the pecans. When it comes to cultivating the trees, Native Americans were the first people to do so. The best varieties to grow in Missouri depend on the area in which they grow. For the central part of the state, cultivars such as Lucas, Norton, Canton, Witte and Shepherd grow best. For the southern part of the state, trees such as Kanza, Goosepond, Pawnee and Posey work well. Trees planted in northern Missouri include Lucas, Wiese, Norton and Warren. Pecan trees thrive along Missouri’s rivers where the fertile soil and sunny conditions help the trees grow to 70 feet in height. The trees live for a long time, too, with some planted in the early 1800s still alive today. For individual growers, trees this large may pose a problem when it comes to harvesting the nuts. Commercial growers rely on special machines to shake the tree and gather the nuts from the ground. For individual pickers, the nuts eventually pop out of the husk and fall to the ground, where they can be gathered. Some gardeners feel tempted to start picking the pecans once the shucks start splitting open. The pecans still need to dry further, though, and are considered green until they do so. Once the nut dries, the shucks turn brown and pull away from the nut. The pecans start falling out of the husks when they’re completely dry, and are ready to be harvested. The pecans should be picked off the ground as soon as possible, since wildlife may be waiting for the nuts to fall off the tree, too. 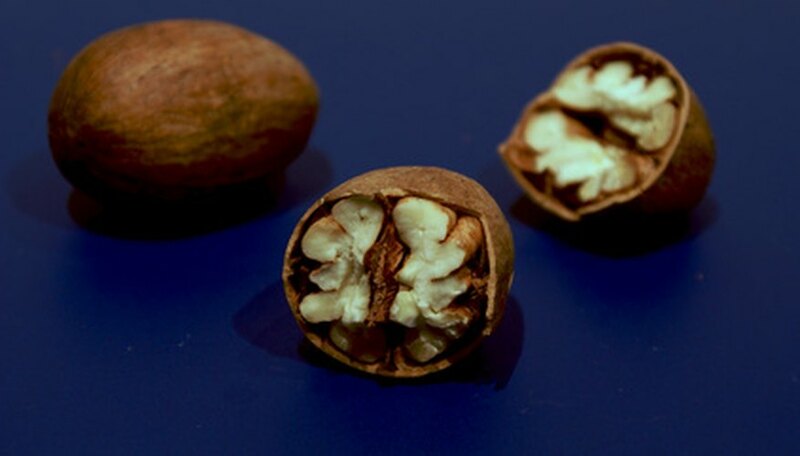 Once harvested, pecans should be shelled with the nuts kept in the freezer where they can stay fresh up to two years.